FAQ - Quality Surfacing, Inc.
Finding the right contractor for your project can be an intimidating task. The first step is to only consider contractors who are licensed and insured to protect you from financial risks. The California Contractors State License Board offers some great tips for everything from determining the type of contractor you need to signing the contract. A: It is usually recommended to seal your driveway approximately 3 years after it is paved, and every 2 to 3 years thereafter. A: Chip seals are generally intended for highways and subdivision roads. Chip seals consist of sweeping all areas to receive the application clear of debris, applying CRS2 oil on said areas by means of a distributor truck, then applying 3/8″ chips over the oil application. A roller then follows behind to compact or set the chips into the oil. The oil is left to cure over night or for a few days, and the excess chips are swept off to the side of the road. In some cases where a subdivision may not want a bunch of chips in the homeowner’s yards, we can sweep up the excess chips with a pick-up broom like a street sweeper and haul them away. 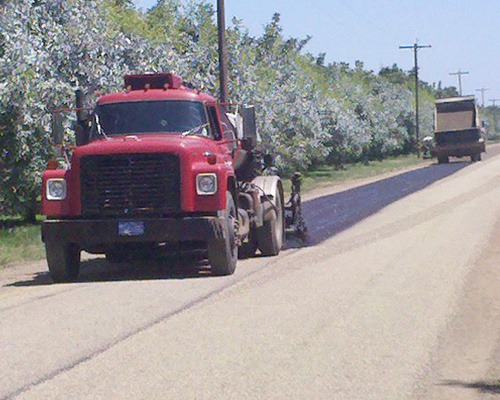 Chip seals are applied as a maintenance on paved surfaces or on gravel roads which is less expensive than paving: this is called a double-inverted chip seal. This is not as durable as paving the road with asphalt and is essentially a double application of oil and chips. It is also important to note that temperatures must be 60 degrees and rising during the day and cannot drop below 40 degrees at night in order for the chips to adhere. A: It is usually recommended to re-apply every 7 to 10 years depending on traffic loads and turning motions. Corners and hills usually take the bulk of the damage over the life of the chip seal. On driveways it is where you stop and turn your wheels to change direction. It is recommended that when you turn your wheels you should always be moving a little and not stay static. 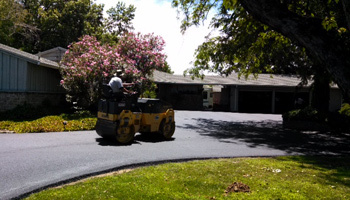 A: We are often asked, “should I pave or chip seal?” There are many different circumstances, but in general, paving is a little more durable than chip sealing and has a smooth, clean finish. Chip seal has a rough finish and gravel left behind when it is completed. Excess gravel is swept off roads but is usually left on driveways. Most of the time the decision is based on the look you are trying to achieve.